Brownies are a life staple. They send your taste buds and mood to a better, happier place. The problem with them is often finding the right one. I’ve had many experiences with bad brownies that are either too dry or too cakey. I believe the perfect brownie is slightly dense, rich but not too sweet, and fudgy. I also always prefer a brownie straight out of the fridge rather than the oven, but that may be just me. Although my recipes aren’t vegan I prefer to make them more vegan than not. For instance, in this recipe I use coconut oil instead of butter along with eggs. However, truth be told, if you prefer butter than coconut oil, you can substitute butter 1:1 in this recipe. What I love most about this recipe is it won’t break the bank. I experimented with dark chocolate and maple syrup but found I got better results with cocoa powder and coconut sugar, and I didn’t have to spend as much money. This recipe is great because it can be whipped up quickly with ingredients you probably already have…assuming you’re like me and always have a supply of almond flour. 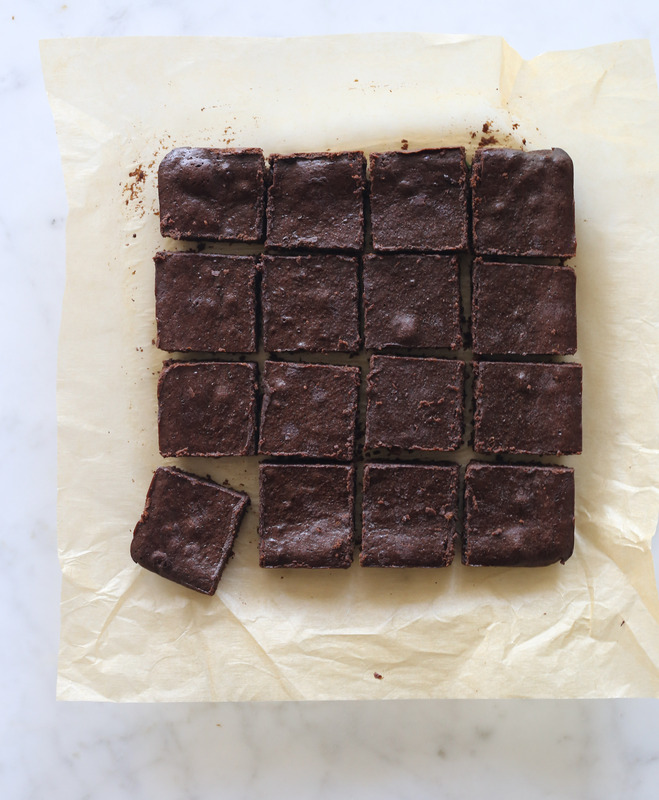 These brownies are gluten-free, grain-free and 100% delicious. They are best enjoyed when feeling blue. Preheat oven to 325°F. Lightly grease and line the baking pan with parchment paper, allowing overhang for handles. Pour about two inches of water in a medium saucepan and bring to a simmer. In a medium heatproof bowl that can rest on top of the saucepan, add the coconut oil, coconut sugar, and cocoa powder. Place the bowl over the saucepan and stir mixture with a spatula until melted and combined. Remove from heat and allow to rest for 2 minutes, or until mixture is warm and not hot. Add the eggs and the vanilla and stir quickly until combined. Add the almond flour and salt and stir vigorously for about 40 seconds. Pour the mixture into the prepared baking pan and spread evenly with a spatula. Bake for 20-25 minutes, or until a toothpick inserted comes out clean yet moist. Do not overbake. Cool completely and cut into 2" squares. This entry was posted in Dessert and tagged brownies, chocolate, coconut sugar, dessert, gluten-free, grain-free, paleo. Bookmark the permalink.